As mentioned in the previous post, John the Red was here yesteday for another Suvarov in the Alps battle, the action at Altdorf. 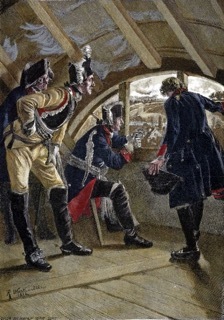 It was vital that the Russians contained and then drove the French off the table as their supply train was due to arrive at the village of Altdorf in the rear of the French forces. John chose to be the Russians which was fine as I'd not played as the French in the previous games. I deployed the French in their historical positions to the north of the stream. The Russian and Austrian forces would arrive over the first three turns. The French were outnumbered slightly but not by much (tell that to the French left!). We used Black Powder with suitable period-specific tweaks of my own added. For more about the scenario please see the previous post. Map of the battlefield and tabletop (almost), taken from the excellent 'Suvorov in the Alps' by Tom Garnett, a set of six scenarios adapted for Regimental Fire and Fury. The main French line deployed behind the stream. The extreme right of the French line with the Reuss River beyond the trees in the background. Horse artillery 'wurst wagon' and battery commander. 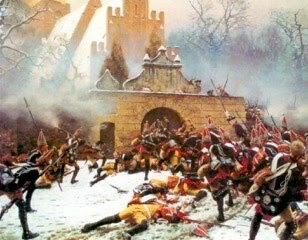 The first Russian brigade supported by some dismounted Cossacks entered the table close to the bridge over the Reuss, which they intended to cross. The following turn the Austrian brigade arrived. 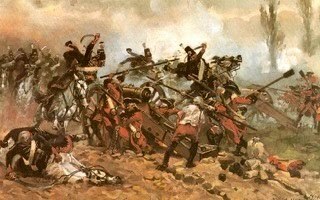 As they (slowly) advanced their leading units were badly shot up and disordered by the French covering the left flank. Indeed the Grenz battalion never really recovered and refused to move for the remainder of the game. Meanwhile in the centre John launched an assault across the stream by two battalions supported by his ex-Piedmontese mule-borne pop guns... er....1pdr artillery. My French fought valiantly but were beaten and forced to retreat shaken. Before the Russians could exploit gap in my centre, I managed to realign two battalions and pour musketry into the victorious Russians who were shaken and halted in their tracks. Meanwhile on the left the Austrians were starting to cross the stream. 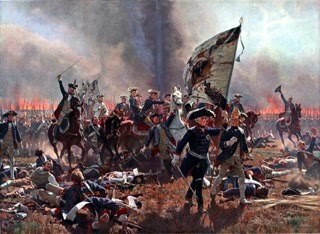 French musketry and artillery fire was deadly but the Austrians marched on. I'd made them large units of 32 figures, not just for the visual impact but also because it would cause them more than a few problems manoeuvring in line, or so I thought. Back on the right I had deliberately pushed my troops up into close range to try and goad the Russians to attack. One Russian battalion was shaken and forced to retire but another charged my cannon, quickly overrunning it, but not without taking significant casualties. My supporting infantry charged the Russian column but were unfortunately forced to retire, but not without shaking the Russians. Meanwhile the Russian commander executed a 'follow me' order and led one battalion of Russians over the bridge. The Russian assault in the centre resumed but was driven off with significant losses to both sides. Indeed, my French brigade was so badly battered that they were deemed broken unable to take any further offensive part in the game. The surviving units were forced to withdraw in front of the advancing Russians, but were still able to shoot them down as they came forward. The last Russian brigade advanced in the centre. Well, they would have had they had passed their command rolls. They were to take a bit of a pasting before they could get to grips with the French. Abandoned by the C in C the lone Russian battalion on the western side of the river marches on towards Altdorf. 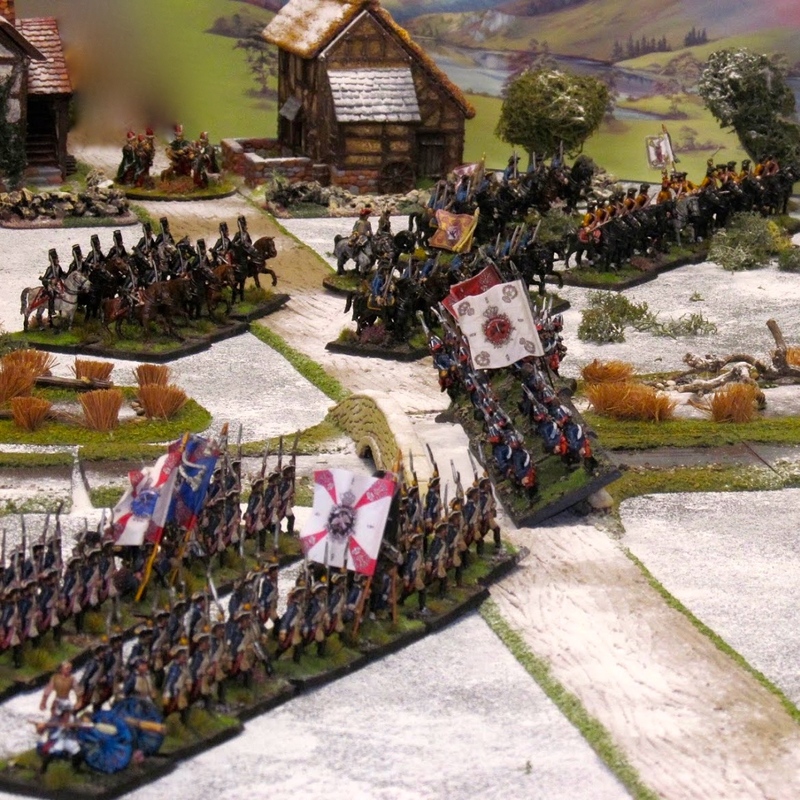 John's Austrians saved their first volley until they were in close range. IR 4 Hoch und Deutschmeister fired. Five dice and five sixes! The French battalion facing them saved most of the hits but was still shattered. The Russians charged over the bridge and against all the odds were held by a single French battalion for three turns. The French right is disarray, with most of the brigade shaken. Their commander proved to be positively useless in trying to rally his men. The French reserve, a battalion of converged grenadiers under the direct control of the CinC, ploughed into the flank of the Russians led by their gallant commander, General Lecourbe. Not surprisingly the Russians were broken and the entire brigade collapsed. The French right and Russian left were now both broken and in disarray. 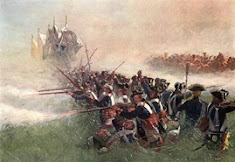 The Austrians edged forward and after another exchange of musketry the French line dissolved, with the exception of a single battalion of 'legere'. Sadly the battalion holding the bridge finally broke, signalling the French defeat. With most of my army shaken or routed I threw in the towel. So, chaos reigned along the entire battlefront. The French were able to make an ordered withdrawal with their remaining forces and the Russian were able to seize Altdorf and rendezvous with the supply train. All in all another great game. John said he'd doubted whether the Russians could break through the French. Sadly for me he was wrong, but it was a tough edge of the seat game for all that. I'm still not 100% sure about Black Powder for this project. However, I've mucked about with the rules and unit statistics a fair bit and they do seem to work and give a good, if not better, game. A rather splendid looking set to indeed. Five sixes in one go! I'm lucky if I throw that many in game. I managed six 1's once! Yes if you discount blunders and FUBARs, David. Wow, Colin even I have not managed that. Wonderful looking game Colin. Great looking figures and table. These armies are truly superb Colin...sounds great! Super looking table Colin and fine AAR.